If you've been gaming for any reasonable amount of time then you've probably heard of DOOM! It's the game that ushered in network deathmatch play in a fluid, 3D environment. Many gamers have spent countless hours in the world of DOOM, and it's still enjoyed by many people today. Various version of DOOM exist, and it's been ported to many platforms over the years. The Atari Jaguar received one of the earlier DOOM ports and even contains networking support for two players (although the networking isn't as solid as it could be). There are some differences from the PC version of DOOM, such as the lack of music during gameplay, but overall it's a very respectable port. 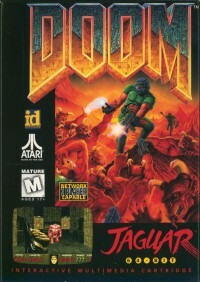 The release of the Jaguar DOOM Source Code was made possible by John Carmack of id Software and Carl Forhan of Songbird Productions. Thanks also go out to Bill "Burger" Heineman. It is hoped that the release of this source code will help stimulate further Jaguar development for years to come, to the benefit of Jaguar fans worldwide. The WAD file containing all the graphics, sounds and levels is not included with the source code archive and cannot be distributed. Please view the readme.txt and license.txt files before downloading the source code.